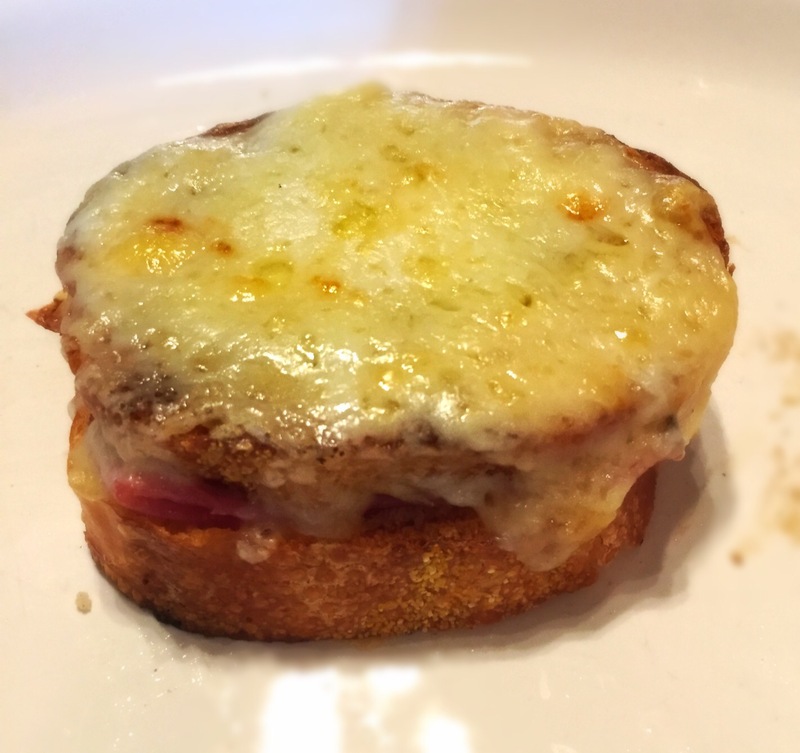 Pacific and June: Bonjour, Croque Monsieur! Melt butter in a medium saucepan over medium heat until foamy. Add flour and cook, stirring, until mixture is pale and foamy, about 3 minutes. Gradually add milk, stirring until mixture is smooth. Cook, stirring, until sauce is thick and somewhat elastic, about 4 minutes. Remove from heat and whisk in nutmeg; season with salt. Move Béchamel sauce off to the side until needed for the sandwiches. First, pre-heat the oven to 350 F with a baking sheet inside (so it heats up). Slice french bread into slices of about 1/2 an inch thick (you don’t want it too thick, or you won’t be able to bite into it easily). My brother and I made 6 sandwiches, but there is enough food to use the whole loaf. Spread butter lightly on the top of the top piece of bread, and on the bottom of the bottom piece of bread. Then, spread about 1/4 teaspoon of the mustard (just enough to lightly cover the bread) on the bottom of the top piece of bread. Place a small slice of gruyere in each sandwich (about 2 inches long, 1 inch wide). Cover with a slice and a half of ham. Then, place half a slice of Swiss cheese on top of the ham. After putting together the sandwich, butter a pan and cook the sandwiches on medium heat until they are golden brown and both sides. When the sandwiches are done, take the baking sheet out of the oven and place the sandwiches on it. After, take the Béchamel sauce and pour it generously over each sandwich until covered. Then, place a heaping handful of the shredded cheese on top of each sandwich. Place sandwiches on the middle rack of the oven and broil on high for about 3 minutes (until the shredded cheese on top is golden brown-but make sure the bread isn’t burning). 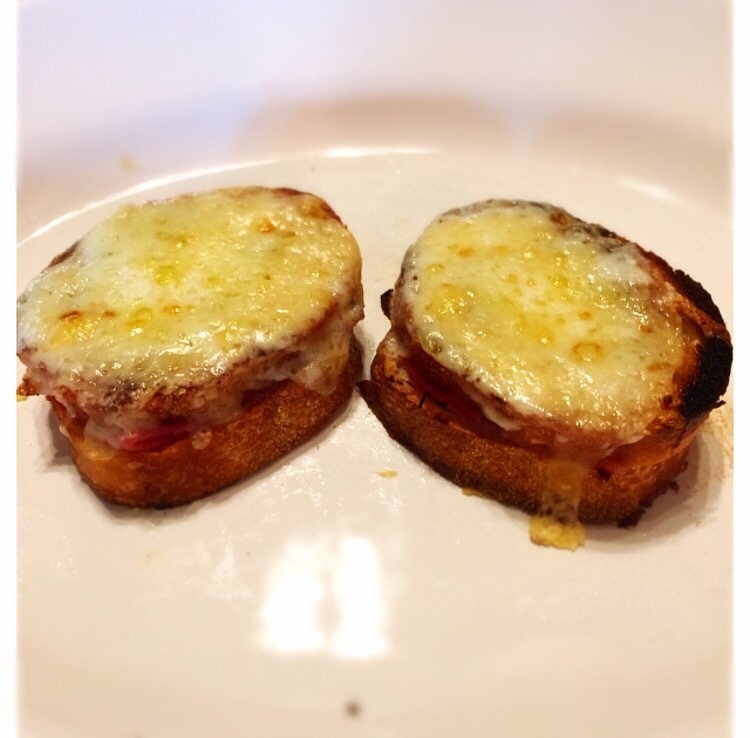 Finally take the Croque-Monsieurs out of the oven and serve the deliciousness!